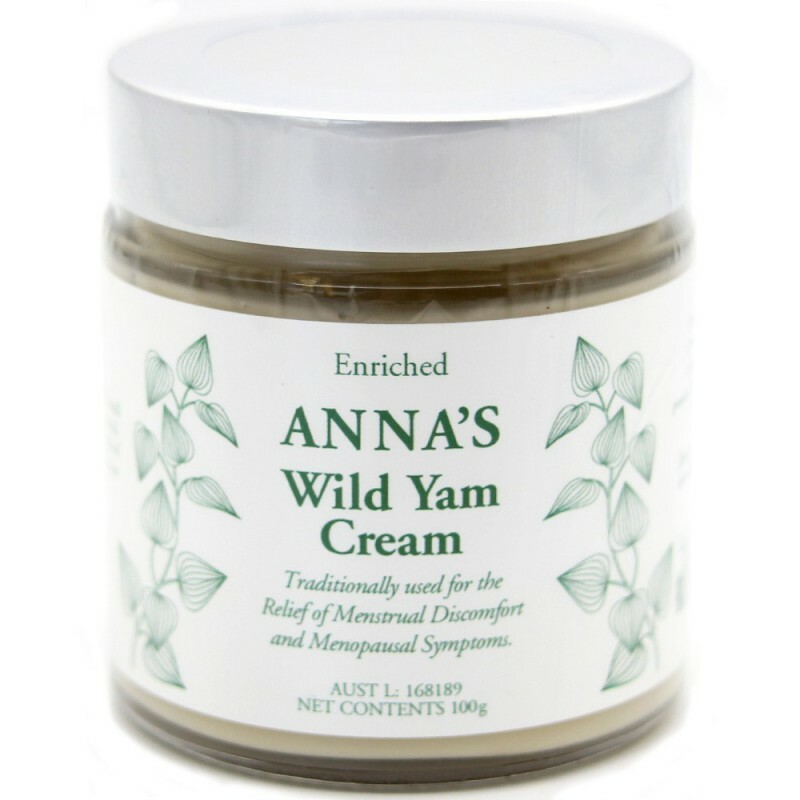 Anna's wild yam cream is an enriched topical remedy traditionally used for the relief of menstrual discomfort and menopausal symptoms. Professionaly blended in Australia from quality natural ingredients. 100g vacuum sealed glass jar. Anna's wild yam cream is an enriched topical remedy traditionally used for the relief of menstrual discomfort and menopausal symptoms. Our complex hormonal system can easily be disrupted by environmental or physical conditions causing am imbalance in the body. Wild Yam cream can help restore and maintain a healthy balance by storing and supplying phyto-steroids in fatty tissue for use when the body needs it to meet emotional and physical and reproductive needs. Dioscorea villosa (mexican wild yam) 1:1 liquid extract (200mg/g); vitex agnus-castus (chaste tree) 1:1 liquid extract (15mg/g), aloe barbadensis (aloe vera) inner leaf juice powder (50mcg/g), tocopheryl acetate (vitamin E) (20mg.g), oil of avocado, oil of soy, ethanol (natural herbal extract solvent), natural preservative containing a proprietary combination of 3 essential oils. I was recommended Anna's Wild Yam Cream by a stranger in a train station after we ended up talking about our fertility issues. The jar won't say that this is a use for the product, because of legal reasons, but it is something that a lot of ladies use it for (as well as for the advertised menstruation and menopause issues). In personal experience, my periods were much milder when using Anna's Wild Yam Cream (I traditionally experienced terrible pain, cramps and nausea). As regards to fertility, I cannot of course say for sure, but I do know that we tried over two years to fall pregnant, and then fell pregnant rapidly after using this cream (just like the lady who recommended it to me). Definitely worth a try, especially as there are no negative side-effects.